Celsius DH fresh water modul - programmable - Celsius a takarékos energia - fűtés rendszerek akár 5 év garanciával. The equipment (20l/min) makes immediately fresh hot water, because it does not store water. Application: on the inertial cylinders or similar, connected to solar thermal installations, wood, pellets, biomass boilers etc. It provides fresh hot domestic water, avoiding phenomena of bacterial pollution, such as the legionnaire’s disease etc., made by the stagnation of the hot water. Control and management of the integration source of the water tank in order to maintain the water temperature at the lowest necessary level. Optimization of control of return temperature to storage tank thanks to the control for diverting valve (the valve is optional). 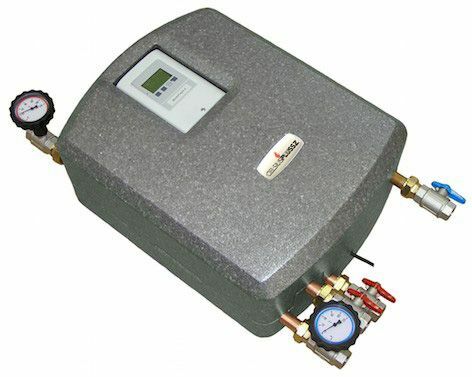 This unit, by a special electronic controller, modulates the speed of the primary circulating pump, from a minimum speed of 10% up to 100%, in order to provide always a precise temperature of the exploitation of the water (f.i. 45°C). The variation of the requested flow is suddenly recorded by a digital sensor that gives the inputs of the flow and the temperature to the electronic controller, modulating the speed of the circulating pump accordingly. External sensor boxes to connect easily external sensors and relays. The pump unit is supplied with 3/4” Male connections (pipe-union). It assures the necessary HDW longer time in base higher Δt. water. Bigger temperature differences allow to extend the tapping time.